We will credit you for the recipe, unless you prefer not to. Also if you have a photo of the finished product, that would be great too. Thanks for sharing yours with us Rebecca. Here's something she tried for Thanksgiving and found to be wonderful! Steam potatoes until tender, 20-30 minutes. Transfer potatoes to bowl and mash until chunky-smooth, adding butter, buttermilk, egg and a dash of salt. Set aside. Sauté shallots and garlic in olive oil. Add minced mushrooms and cook until they release their liquid and pan is almost dry, 10-12 minutes. Add chard, stirring until wilted, about 4 minutes. Whisk broth and flour together in a small bowl. Add to pan along with minced rosemary and salt & pepper to taste. Cook, stirring until it thickens, about 2 minutes. 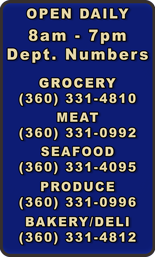 Payless Foods - 1609 Main St., Freeland, WA. 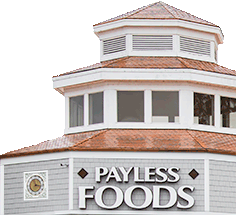 98249 - Main Store # (360) 331-4810 - © 2009 Payless Foods, Inc. All rights reserved.